This session provides a gentle introduction to the concept of chromosome mapping. DNA test results can be immensely informative, but the wide variety of new concepts, terms and technology can be intimidating. Since chromosome mapping is visual, it can provide a useful and practical framework for learning the essential concepts of DNA for genealogy. Alongside definitions and explanations, this session will address why you would try chromosome mapping, and what you can realistically hope to get out of it. A brief introduction to current tools will be provided, along with a summary of what you need to get started. 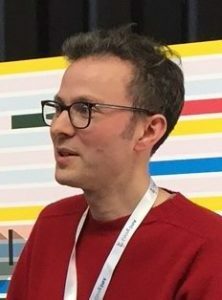 Jonny Perl is a genealogist, DNA enthusiast and web developer based in London. He is the creator and founder of dnapainter.com, an award-winning web application for chromosome mapping. Jonny has also collaborated with leading genetic genealogists to create other popular tools that help people around the world interpret the results of their autosomal DNA tests. Jonny’s passion is in exploring new ways of visualising DNA and family tree information to help make it more inviting and user-friendly. Born in Belfast, Jonny has family roots in Ireland, England and Germany.